*An English Travel Writer*: Christmas! Nearly Christmas! Time to stop obsessing about politics and think of better things. (In fact, it's almost always time to stop obsessing about politics and think about better things). I hope you'll like to see a few Christmassy photos that I've pulled from files from various years, and I hope you enjoy them. 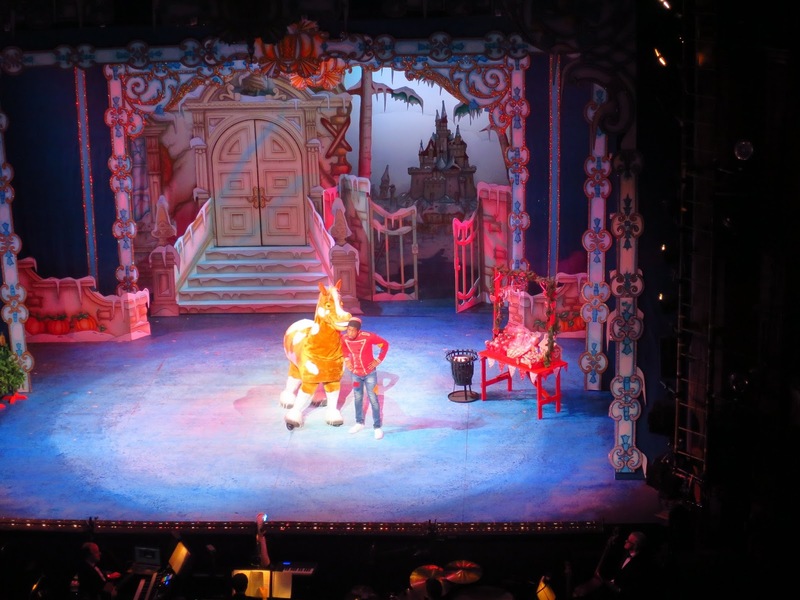 On Wednesday we took S and A to the trad panto at Hackney Empire - a mix of hiphop, jazz, schmaltz, talented dancing, the world's corniest jokes, over-the-top ugly sisters, hilarious ghosts, amazing special effects and lots of audience participation. Here's "Buttons" having a conversation with the pantomime horse, Clopton. We all squashed into the tiny seats they always seem to have in these old theatres, and the lads consumed what seemed like their weight in Haribos and pork pies, and we all had a very good time. 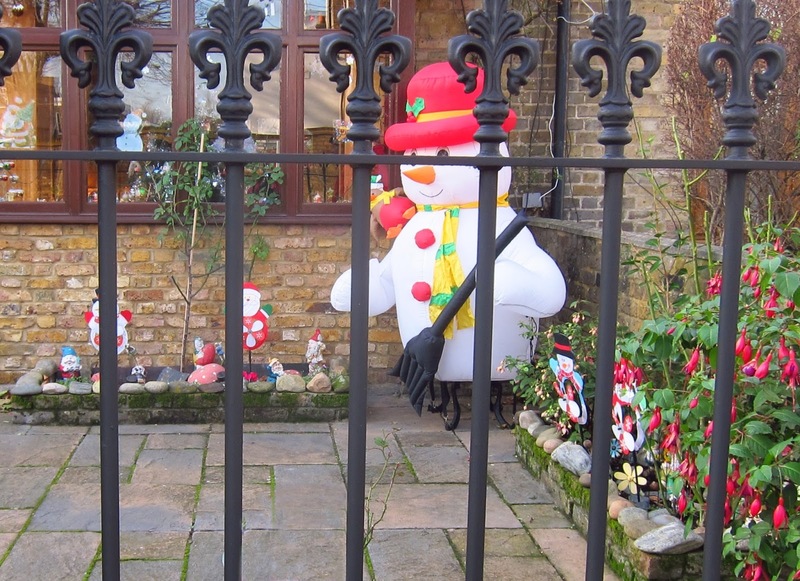 Here's a very festive garden in Hackney, (complete with fuschias, so there can't have been any snow or frost yet.) I think the santa looks very pleased with the good job he has done in keeping the flowerbeds tidy. places, Munich airport, less for the detail than the bold concept of a ski slope cutting right down through the airport. Can you see someone has come a cropper right by the deer? 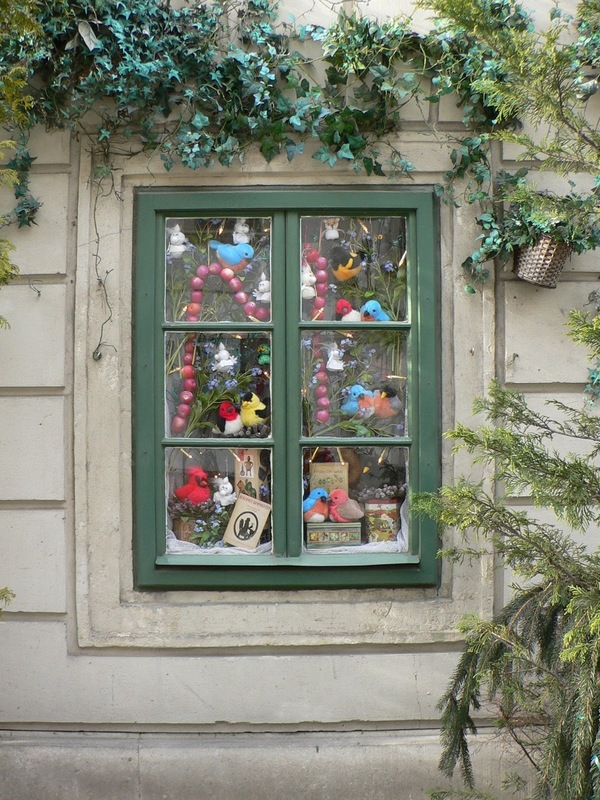 Here is a beautifully decorated Christmas window in Vienna. 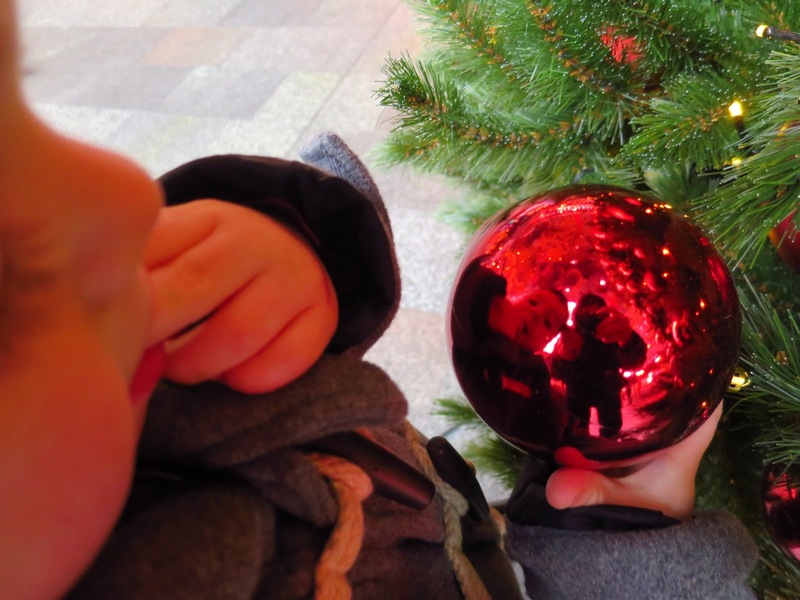 And here's one the twins reflected in a Christmas bauble in Rotterdam (with me taking the picture, also reflected). He was very interested in seeing himself looking all red. And this was their Christmas present to us last year, decorated with their own fair hands. And some very expensive Christmas sweets looking very beautiful from Fortnum and Mason (which I like to visit every year before Christmas). Lovely though they were, I'd rather have the things the children made. As I look at what seem to be ever increasing numbers of homeless on the streets, I know that for many people, Christmas isn't necessarily a happy time. They might be undergoing some kind of crisis, or have nowhere comfortable and pleasant to be, or they might be grieving a loved one. 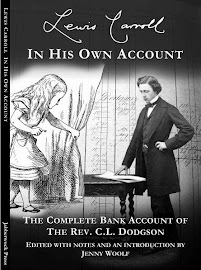 I was touched by a recent post by Jeanie, who I've been following for some years. Her blog "The Marmelade Gypsy" is usually upbeat, but she posted this which struck me as a very good thought to keep in mind amidst the celebrations. I hope your Christmas is a peaceful and contented one. Thank you, dear Jenny, and the same to you and your loved ones! Your collection of photos is indeed very Christmassy. My favourite is Southwark Cathedral. Today, I have had my last day of work for this year, and boy am I ready for some time off! This year was super busy work-wise, as well as travelling to and from O.K. 's on most weekends and more activities there. You are right, Christmas is not a happy time for many people, and to many, it does not mean anything really, or they just feel stressed out with all the preparations. I hope that everyone can find at least some peaceful corner in their heart and mind to retreat to over the holidays. I haven't yet caught up on blogs since Christmas but I hope you had a good one - and more relaxing than you were expecting when you wrote the comment. You have certainly been travelling more since you became close to O.K. but that seems like a good thing on the whole :) I hope that 2018 is a good year for you. Lovely post, Merry Christmas to you and your family. Same to you and a happy new year with many more blog posts! Thanks for sharing all your travels and bits of this and that. Have yourself a peaceful Christmas with lots of hugs and laughter. Thank you Christine, and the same to you - and a good 2018. I have always Thanked My Lucky Stars the day I found your blog ! You bring such happiness, joy and sometimes a tear. Wishing You and your family the most wonderful Christmas. Thank you Parsnip, that's a nice comment. And in this case double the good wishes, and also double the number sent back from me to you and yours! I love the ski slope at Munich airport. How clever. Is that meant to be deer poo on the ground? Ha. I haven't been to a panto for years and really miss them. It really gets you in the mood for Christmas. I hope you have a wonderful Christmas, and don't eat all those cookies and sweets too quickly! Hmm, dunno about the deer poo. I wouldn't be surprised. :) Thanks for the good advice, my sweet tooth isn't as sweet as it was but that gets a bit tested over Christmas. I hope 2018 is a good one for you and your family. What a beautiful cathedral! Seems like those twins were just born! And they are old enough to help make cookies?! Goodness! I know. And I can't believe you are now a granny of TWO, Rita! They love to make cookies (and eat the dough). Peace and love to you in 2018. And may yours be so as well. Not to mention a good 2018! Thanks for the European photo tour of the holiday season. It's a pleasure. I hope you had a lovely Christmas! What a very cheering collection of photographs! Thank you Helen, and Happy New year! And you too - and look forward to reading more of your lovely posts in 2018! Merry Christmas! Seeing the decorations makes me smile. There are indeed. You are such good people, and I hope 2018 is a happy year for you all. Thanks for sharing the festive photos. I agree that German-speaking countries do the best Christmases. Who else would put a ski slope in an airport? I really like that decorated window in Vienna. I visited Jeanie's blog and truly appreciate her thoughts and sentiments. My mother passed away just before Christmas eight years ago and it was an extremely difficult time. I never fully recovered. All good wishes to you and your family for a blessed and peaceful holiday. I hope that your Christmas was good, Jon, and I am glad that the post helped. It is so easy to forget that Christmas isn't always fun for everyone. I hope 2018 is a good year for you. And I hope you have a peaceful and very Merry Christmas. The same to you - and a good 2018! It is many years since I saw a pantomime but your post reminded me of the joyful days when I did visit the theatre. Merry Christmas, Jenny. Oh, yes, pantos are something special, aren't they? Merry Xmas and I hope 2018 will be good to you Valerie. What a lovely festive time you are having! Hope your Christmas was good, Jo! Wishing people peaceful times in this season. And a happy new year to you - I know it is an important time in Japan. Dump the politics, it stresses you out too much. More church services with large choirs, more homemade kids biscuits, more days put and another panto are in order. May your Christmas be anything but white and very enjoyable. Yes, that is the recipe for a successful Christmas, to be sure, and I am glad to say it wasn't white. I hope 2018 is a good one for you. Dear Jenny, I liked your photo of A reflected in a red decoration, amazing! And the same to you, thank you! I agree re stopping obsessing about politics. As the year progressed I found myself doing so...and I have no feelings of guilt becoming a bit of an ostrich with my head in the sand. They're all cut from the same cloth, I reckon. Yes, politics has been the flavour of 2017 worldwide. I hope things lighten up a bit in 2018. I hope your Christmas was lovely and may your new year be wonderful! Not sure if I wished you Merry Christmas but a second one can't hurt ! I think you did but that made it twice as nice. I hope yours was also good! 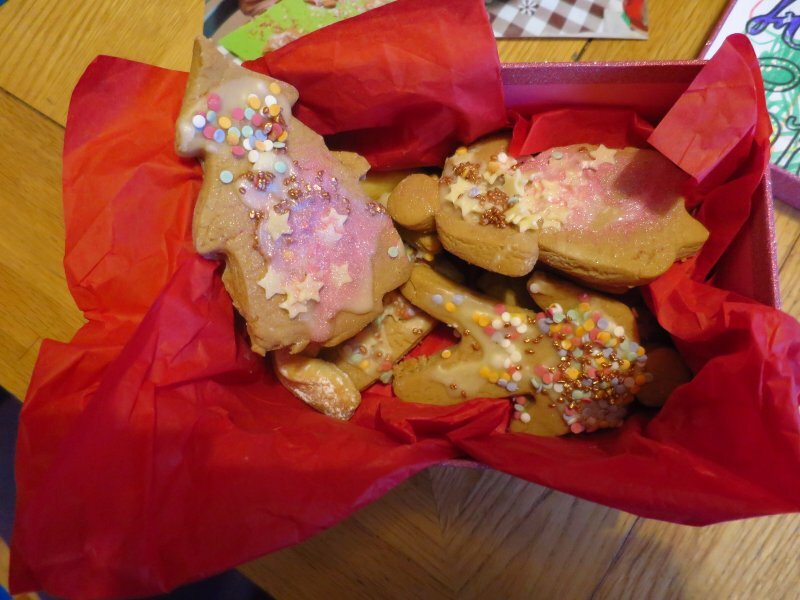 A lovely Christmas post, Jenny! The photos of Christmas scenes in various places are lovely. 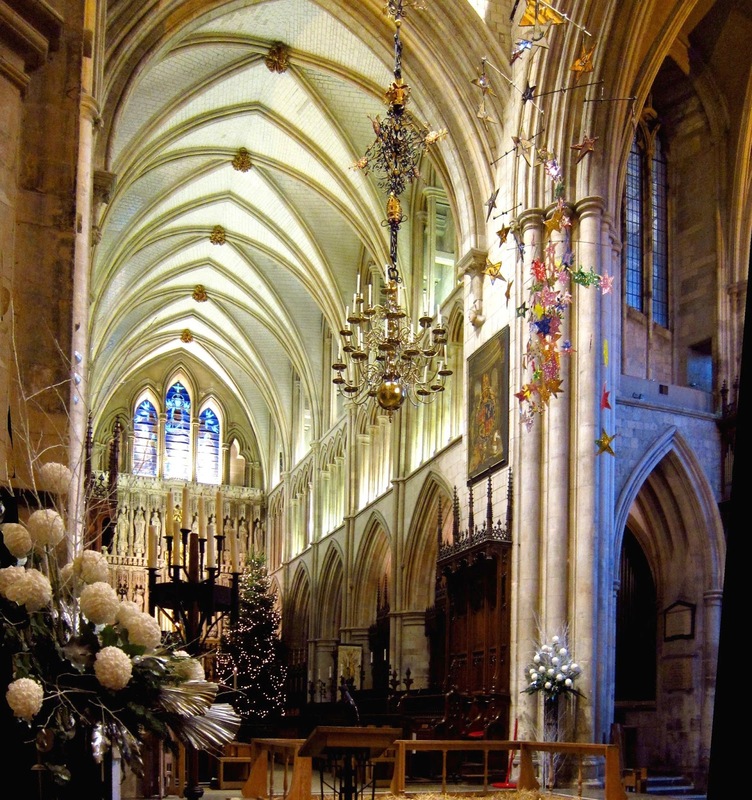 I'd forgotten that Southwark Cathedral was so beautiful! Lovely! It is a very nice cathedral even though it is not as old as many - it's still very historic. I hope you enjoyed your Christmas. Wonderful Christmas photos. - Merry Christmas to you & yours. Thank you very much Ida, and the compliments of the season are returned! Jenny, everything you posted here is so beautiful. I love the cathedral and the panto looks such fun. I love the colorful set design and I can imagine everyone had a jolly good time! The airport, the windows, the garden -- such a wonderful way to see Christmas in so many places. Sending joy, love and belated Christmas greetings to you today! And thanks for sharing the post with the link to the holiday survival kit. I hope it's helpful to someone. Thank you Jeanie. I hope you have a wonderful 2018 and thanks for your lovely card! Lovely. Sometimes it is good just to think of the beauty and joy in your life. It's usually the best way and I try to do that. Happy Christmas! Beautiful photos, wonderful post. I hope your Christmas was merry and peaceful! Thank you! Our friends in Orlando said they had FROST so if you did, too, I hope it was a fun and slightly different experience. But in any case I hope your Christmas was great! Those Fortnum and Mason sweets look amazing, but as you say there's nothing like something home-made. 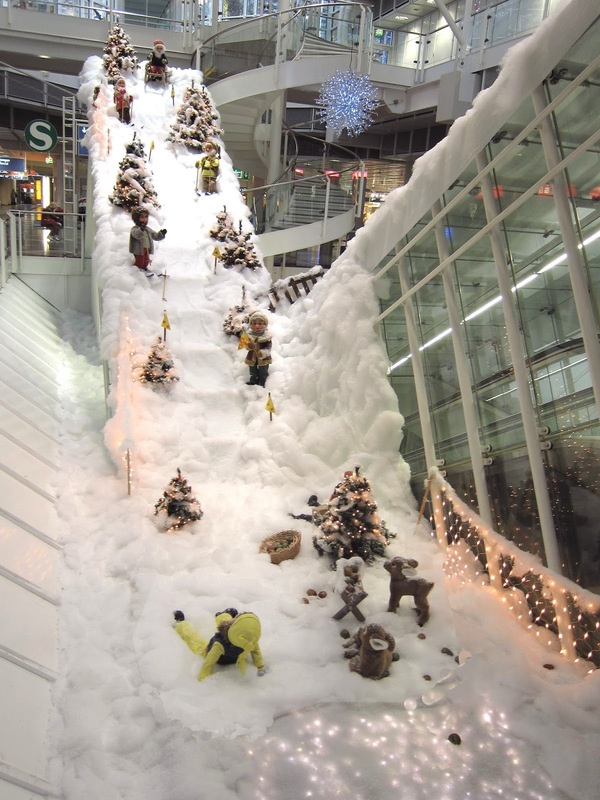 I love the ski slope in the airport - what a wonderful idea! Happy New Year to you and yours! :-) I hope 2018 brings you lots of happiness and health. 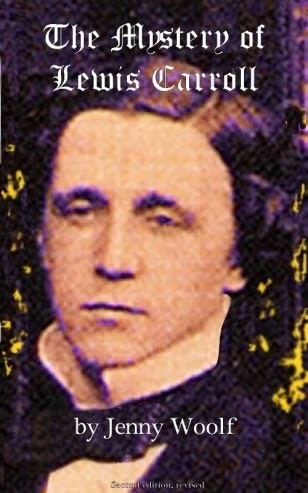 DElightful series of beautiful photos dear jemmy! these gifted cookies look delicious! what wonderful place to visit and have fun with family indeed! faith which can make miracle happens . we can make our hearts light by helping whom we can help at least .